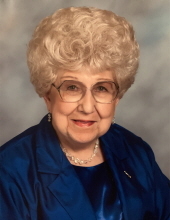 Bonnie Lou (Roby Caudill) Mitchell, 93, formerly of Charles City, passed away Monday, November 26, 2018 at The Bridges at Ankeny. When she returned to Iowa she felt very blessed to be closer to her family. She is survived by her children: David Mitchell, Rebecca Lou Quinn, Sara Lou Buggs; grandchildren: Jeremy (Dana) Mitchell, Jennifer (Chris) Anderson, Ben (Kristi) Exline, Zach Exline, Elliott Buggs, Alivia Buggs; great-grandchildren: Hannah Mitchell, Jacob Mitchell, Courtney (Josiah) Delpierre, Jonah Exline, Madeline Exline, Isaac Exline; great great-grandchild, Joaquin Delpierre; siblings: Art (Karen) Kloos, Don (Pauline) Kloos, Wayne Kloos; sister-in-law, Alberta Kloos; in-laws: Joe (Marion) Mitchell and Marion Thomas; along with numerous nieces and nephews. Bonnie Lou was preceded in death by her 4 parents: Essie Kloos, Floyd Roby, Dr. Boone Lacy and Ethyl Caudill; husband, Bud; daughter, Amy Lou Mitchell; siblings: Darlys Caudill (Virgil) Lietz, Norman (Thelma) Roby, Marilyn Roby (Bill) Kauzlarich, Betty Kloos Edmunds, Velma Kloos Mohr, Twyla Kloos, Wanda (Nelson) Kloos Sargent, Glenn Kloos and in infancy, Alberta Kloos; in-laws: Margaret (Marinus) Mihm, Delores (Donald) Blong and Alfred (Pepe) Mitchell. To send flowers or a remembrance gift to the family of Bonnie Lou Mitchell, please visit our Tribute Store. "Email Address" would like to share the life celebration of Bonnie Lou Mitchell. Click on the "link" to go to share a favorite memory or leave a condolence message for the family.